Born in 1923, Ned Rorem is today one of America's most revered and sought after composers and his work has been an important cornerstone of American music for more than half a century. He is the recipient of many prizes and accolades, and his vast oeuvre includes compositions in practically every genre. Notwithstanding this huge amount of activity, Rorem is justly renowned for his art songs of which he has written more than 500. Although his language is, as expected, very modern, I found his music stimulating, emotional and surprisingly accessible. 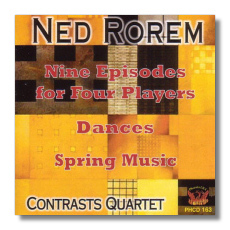 'Nine Episodes' is the latest work of the three on this disc and comes from a very difficult period in Rorem's life having just lost his long-time partner James Holmes to AIDS in 1999. premièred in January 2002 in New York, the piece depicts an artist trying to come to grips with the harsh realities of death, and his struggle to conquer the effects of this infallible truth by means of music's powerful tool. 'Dances' (1983) reveals Rorem in lighter vein. Commissioned by the Music Study Club of Metropolitan Detroit, this 7-movement suite is full of brisk and breezy music typical of the same composer's 'Picnic on the Marne', a piece written round about the same time. The grandest piece on this CD is certainly 'Spring Music' composed in 1990 during a particularly fertile period in Rorem's life. Written on commission from the Carnegie Hall Corporation for the Beaux Arts Trio, this five-movement work is a moody and expansive piece, very reminiscent of Brahms' C Major Piano Trio – a weighty, well-timbered composition that is both objective yet incomprehensible. The Contrasts Quartet, made up of four extraordinary female virtuosi gives exhilarating performances of these innovative pieces and their refreshing approach will certainly win these works many new fans. Excellent sound and balance from Phoenix (USA) complete this enterprising disc which I wholeheartedly recommend to all those willing to discover new musical worlds.